June 2017, two teams of artists will collaboratively design art work highlighting Grinnell's, rich past of small-town businesses. Get ready for a full month of local history exploration and community celebration. Designed in collaboration with the Grinnell Historical Museum. In May 2014, Grin City Collective launched the "Public Writing, Public Libraries" pilot program with Drake Community Library in Grinnell. 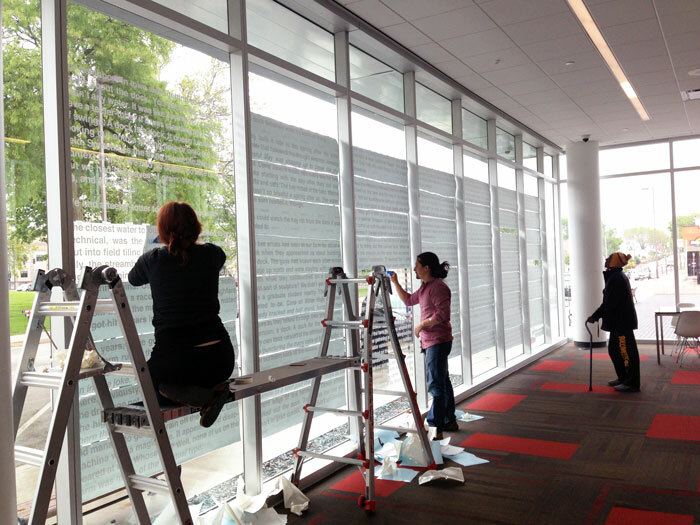 There, three writers installed in vinyl film short works or excerpts of fiction, nonfiction and poetry in the library windows, essentially turning the glass into the page of a book. Designed by the Grin City's 2012 Emerging Artists, the book functions as an exquisite corpse, a method by which words or images are collectively assembled. Each collaborator adds to a composition in sequence, either by following an artist's self-imposed rule or viewing only the previous piece.